I got my DR500GW-HD today and install the custom fw. I intend to customise heavily. I bought this camera with an unusual use in mind. I'd like to see if I can use it for monitoring the night sky, to detect and record meteors. At first glance it looks like a promising camera. It's intended for continuous recording, has a decent resolution, a wide lens and wifi and Linux shell access allowing customisation. Obviously my settings need to be a bit different from what works in a car. I will have a dark and static environment. So I've playing a bit with the settings in avserver.sh. First of all I changed the resolution to 3 MP. The gives me a wider view, so I will cover more of the sky. Moreover, I'll get fewer fps. If that means longer exposure time, it's good, I need all the light I can get, but I'm not sure whether the exposure is longer. Then, since the image will be noisy, I've enabled SNF and TNF. I have a static image, so TNF should have a lot of potential. Unfortunately, it doesn't seem very aggressive. I wonder if it's possible to tune its aggressiveness. B frames would also be nice, but a bit of googling tells my that they're not supported on DM36x. CABAC instead of CAVLC also helps. I've enabled it in config-custom.ini. I also set the mode to 1, so I can use avserver.sh. But when I analyse the H.264 stream, it's not using CABAC. How can I enable it? The white blinking LED in the front is annoying. It reflects off glass and gets recorded. Is there a way to turn it off (a workaround is of course to cover it up)? If I kill av_server1.out (to change the parameters), the camera soon reboots by itself. Is there a clean way to restart av_server with new parametes without having to reboot? av_server1.out seems to be something TI has provided, that Pittasoft has modified to their needs. Is the source code available anywhere? I've only been playing with the camera for a few hours, so I probably should have figured out more myself before posting a lot of questions (/etc/sysconfig/start.sh looks like a good start to understand what's going on). But I also wanted to say that I'd like to contribute. I have more than 20 years of experience with Linux, including embedded ARM based systems, I know video encoding well (I have implemented H.261, H.263, H.264 and H.265 codecs), and I have some familiarity with the TI DSP's. 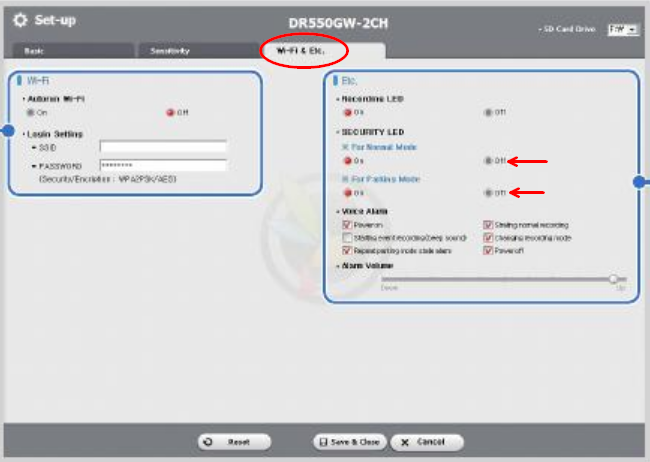 Do(es) the developer(s) of this firmware read the English forum? EDIT: Several options in config-custom.ini don't seem to be used anywhere, such as AGGN, AGGS, AECB, Cabac, etc. Am I missing something? midtskogen, that is an interesting way to use a DVR! Even though such equipment may not be the best suitable. as its aperture is 1,6. With IR Cut - if it is needed - the model should have an index C: B3M3616C. As for matrix, you cannot change it to 3MP as it is the 2MP Full HD matrix. Changing settings will not change physical properties. The other obstacle is that the DR500GW-HD is falling into a parking mode. You have to play with a sensitivity, but it may not guaranty that the event will be properly and entirely recorded. Mentioned settings are valid for Video=2 mode. You may find answers to many of your questions in documentation. Nothing's perfect, but the cost makes it attractive. Yes, I notice that the DR500GW-HD will not pick up anything below a certain threshold. Strictly speaking, it is not necessary since only bright meteors (let's say mag -6 or brighter which DR500GW-HD will reasily record) are of interest, but it would still be great to be able to record at least the brightest planets and stars as reference points. However, I don't really need 30 fps. A lower framerate opens the possibility of longer integration time (exposure). Also, the processing and bitrate requirements are lowered as well. But I don't think I can change this with the stock av_server. It says S mount and 1/2.5" sensor. Is this correct for the DR500GW-HD? While the stock lens is wide, changing it to a fisheye would be really nice. As for matrix, you cannot change it to 3MP as it is the 2MP Full HD matrix. Yes, I found out. If I select 3MP, it will simply stretch the image. The other obstacle is that the DR500GW-HD is falling into a parking mode. That can be switched off in the original settings, can't it? Apparently they're using code that comes with the IPNC reference design. As far as I've found out so far, the code is free, but is only provided when you buy a reference camera, which costs about $1000, which may be reasonable for a company wishing to make a new product, but not so much for me. I'll check a bit more with TI. And even if I get the code, it could require some reverse engineering to have it talk properly with the sensor, etc. However, if it is possible to get it work this way, it would open up a lot of possibilities with this camera, not just for me. Problem not in SSH and enciphering, a problem in the insufficient productivity of the built-in ARM processor. You can copy files not only by means of SSH, but also by means of FTP. Speed both in that and in other case will be low. If the Video=2 variable, is responsible for inclusion and shutdown of CABAC the corresponding variable in the file. Dashcam reset in case of problems with avserver is carried out by hardware watchdog. It is impossible to disable it. To it problems with busy random access memory after avserver kill increase. 2) in source codes of TI there is no driver of a video sensor of OV2715 without which it is impossible to carry out full compilation of avserver for our DashCam. ave123, thanks. That answered everything, I believe. insufficient productivity of the built-in ARM processor. Yes, and encryption adds to that. The only thing I've tested, though, was with another dashcam that didn't have WIFI. So I used a Transcend SD card with WIFI, which once I figured how to get shell access turned out to use a 100 MHz ARM processor running Linux. By disabling encryption I was able to double the transfer rate from around 350 KB/s to 700 KB/s. While this was a pretty cool solution, it could add WIFI capability to almost any camera, but it wasn't stable, it would only run for a day or so before the filesystem got corrupted. I think the Transcend card had an overheating issue. SSH is more convenient than FTP since I'd like to use rsync to offload files before they get overwritten. But there are several options. I suspected that, and I assume that Pittasoft is not likely to give away any source code. Does anyone know the F number for the stock lens? Do I have to reload the original firmware to do this? midtskogen, what do you mean?